With the Surface Book 2 (13.5-inch), Microsoft has crafted one of the most powerful 2-in-1 laptops in the world. The Surface Book 2 has some powerful enough components to handle most day-to-day tasks, and even some light gaming and video editing if you go for a model with a dedicated graphics card. Brilliant build quality and excellent battery life make this a wonderful device for using as either a laptop or as a powerful Windows 10 tablet. It also comes in a 15-inch version, which is more powerful and with a larger screen. 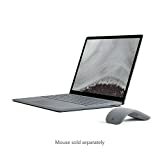 Surface Book 2 is the ultimate laptop for running powerful apps in Office, demanding graphics software, inking in Windows and more, at work or on the go. Run professional-grade software all day with the latest quad-core powered Intel® Core™ processors and the best graphics performance yet with the latest NVIDIA® GeForce® GPUs – 7th Gen Intel® Core™ i5-7300U processor, Intel® HD Graphics 620 integrated GPU. Connect all your devices with USB 3.1, full-size SD card, and Surface Dock. * Use the new USB-C port as a single connector to charge devices, transfer files, and display video on external monitors. The Surface Book 2 with Intel® Core™ i7 processors power Windows Mixed Reality experiences. Get immersed in VR games and content when you pair the Surface Book 2 with a headset* and motion controller. *The Surface Book 2 packs 70% more battery life than MacBook Pro 13”.1 Surface Book 2 13.5” boasts a higher resolution than MacBook Pro 13”.